Devine Lu Linvega is an illutrator, programmer, creates a language and also distributes his own music under the moniker of Aliceffekt. This Montreal based talent, goes a long way and travels far to get his inspirations. Aliceffekt recently took the stage at Montreal's famous Kinetik Festival 4.0 where bands and DJs of Industrial/EBM/Eletronic music worldwide shared this five day event. Vermillionth (available for digital download on xxiivv.com) was released based on that performance. Following that release is Blam, Le Passage Sacrilege, and it is available just after three month on the official website. First track starts off short with a distorted conversation clip that leads to a more upbeat track. As Aliceffekt is known for its noise dance tracks, its glitchy mad beats aren't going to be easy for the most seasoned club goers to understand. 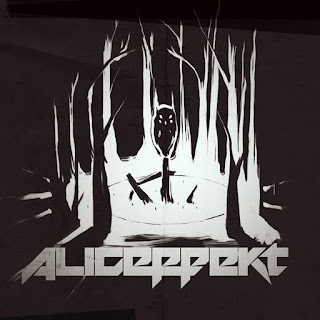 In fact, it is the reason why Aliceffekt's music has been categorized into the Industrial scene. A Post-Industrial chaos that draws it's experimental structure from pioneering acts such as Throbbing Gristle. Every track crosses into the next track perfectly seeing that all of his works are usually recorded for live performances. This is an album worth listening to when you're up for some headbanging or just kicking out some dance moves no matter what your mood brings you. Blam, Le Passage Sacrilege is available for free download here at 320kbs mp3.